First post - a salad of leftovers and some new ingredients I bought on the way back from work. Shallow fry the tofu in the vegetable oil, over medium heat until golden brown on each side (about 4-5 minutes each side). Let it rest for about 15 minutes before cutting into roughly 1cm width cubes. Toss the sliced garlic around in the leftover oil from frying the tofu for about 1 minute, till lightly browned. 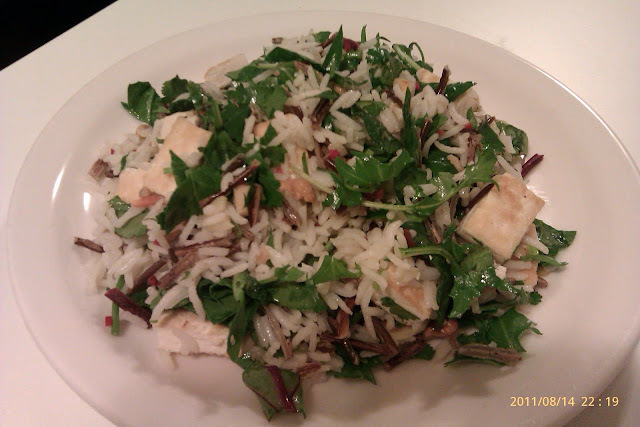 Toss together the rice, garlic, chili, cashew nuts, tofu, coriander and salad mix. Pour over the lime juice and sesame oil, and toss the mixture to coat it well. over low heat until they had that slightly charred look. *** Adjust the amounts of lime juice and sesame oil to your taste. Oh and FYI, the leftovers I used in this recipe were the salad mix that I had been using over the week in my sandwiches for lunch (for work), and the basmati rice I cooked a few days back for dinner. Being the slow-poke I am, it took me about 40 minutes to 'whip this up' - anyone else who tries this will probably be quicker. I can tell you, it's definitely worth it! The carbs and tofu will keep you full for a while, and the whole recipe is just soooo healthy and super yummy :) Nom nom nom. The dressing, which is basically just sesame oil and lime juice, is an amazing complement to the salad. Love it. Possible variations could be to throw in toasted sesame seeds, replace the cashew nuts with almonds, use different salad leaves, or even throw in some sliced carrot! Maybe some finely diced shallots? Really, the sky is the limit here.